Dentistry and dental hygiene students in the Dalhousie Faculty of Dentistry are taught nutrition according to the guidelines found in Canada’s Food Guide. That means the launch of the latest version – the first re-write since 2007 – is like introducing a brand-new textbook. And that’s a good thing, even though the course will need to be revamped to reflect the changes. Prof. Heather Doucette in the School of Dental Hygiene, and Dr. Mary McNally, assistant dean of research and professor in the Department of Dental Clinical Sciences, teach nutrition to students in the Faculty of Dentistry. They feel that Canada’s Food Guide is the best source of nutritional advice available to them. “The course I teach, ‘Nutrition for Preventative Dentistry’, is a basic theory course about how nutrition affects oral health,” says Prof. Doucette. Both Dr. McNally and Prof. Doucette welcome some of the changes new Canada Health Guide in its first major update since 2007, particularly specific references to oral health and its connection to overall health. “I’m pleased to see that water is being promoted as the drink of choice and that there is a move away from juice, which previous guides suggested could be treated as a source of nutrients,” says Dr. McNally. 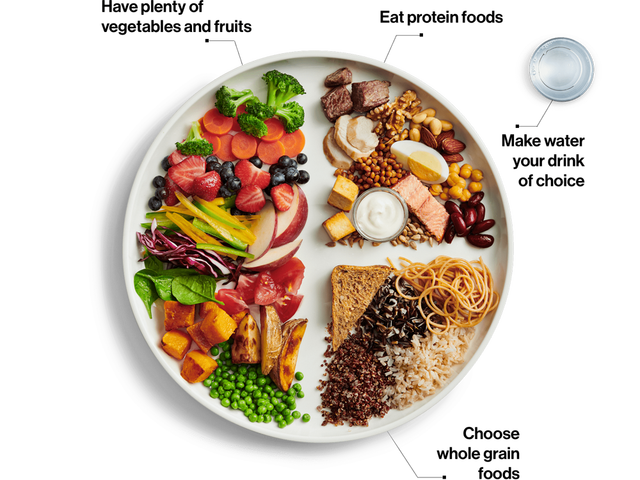 In the new food guide, the familiar rainbow of four food groups – fruits and vegetables, grain products, dairy, and meat, fish, and other proteins – has been replaced by a single plate, half of which is filled with fruits and vegetables, with the remaining quarters devoted to proteins and whole grains. Dairy products no longer have their own group in the new Canada Food Guide. Instead, they fall under the protein umbrella. Both professors question whether the change of emphasis could have an adverse effect on people’s consumption of calcium, which is essential for the development of bones and teeth. Dr. McNally also points out that it is the “single, most high- quality source of protein for children”. Grabbable sources include a glass of milk, a piece of cheese, or a pot of yoghurt which provide not only calcium, but vitamin D (frequently added to dairy products), which helps the body to absorb calcium. Less readily grabbable calcium sources would be tofu, sardines, beans and lentils, and seeds. Overall, both Prof. Doucette and Dr. McNally welcome the inclusion of specific oral health information, a first for Canada’s Food Guide. Dr. Sara Kirk, a professor of health promotion at Dalhousie University and one of the academic advisors consulted for the new Canada’s Food Guide, says that the specific mention of oral health is an important one from the perspective of promoting healthy populations.